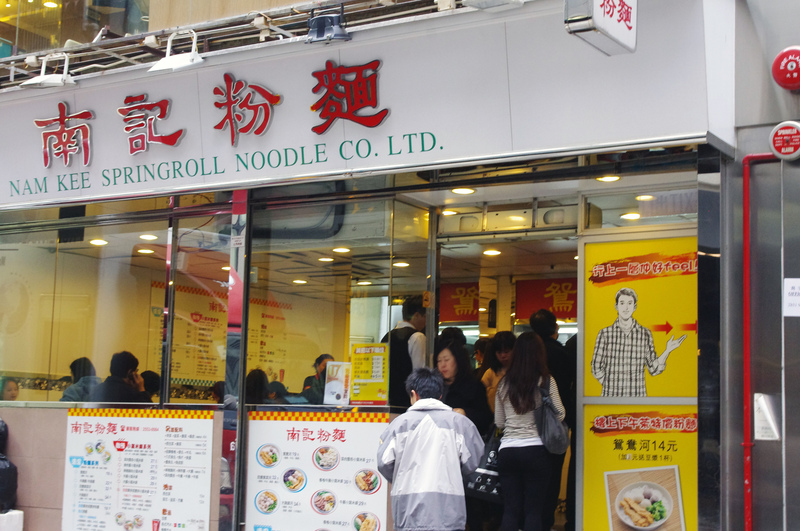 Nam Kee Springroll Noodle Co. Ltd. is the perfect place to stop for a hot bowl of noodles—morning, noon, or night. This budget-friendly eatery is a popular local chain that serves up several different delicious noodle bowls. Nam Kee Springroll Noodle is always busy, especially during breakfast as savory noodles are a favorite Asian breakfast dish. The 'Mai Sin' noodles (thick rice noodles that are cooked al dente) are fantastic, with the prefect chewy texture. The broth is either pork or fish based (depending on which bowl you order) and the whole dish is topped with Chinese veggies, dumplings, and tender sliced meat or fish. The pork dish is probably the most popular and if you like spicy this is the bowl you should order. If you're not a fan of spicy try the fish balls with noodles, it's more mild and also delicious. The menu is only in Chinese, so if you don't read Chinese you'll have to rely on the menu pictures to point out what you want. Don't worry, there are only eight noodle bowl options and they're all good, so don't worry too much about which you choose. The spring rolls don't come with the noodle bowls, so make a point to order that as an add on if you want one. The spring rolls aren't crispy, they're soft wrapped so they won't get soggy in your bowl.